Come to my house right now and you’ll probably find me with a cup of coffee in my hand or resting nearby. It’s not really surprising that I go through a ton of coffee grounds. My coffeemaker grinds the beans fresh for each cup of coffee and I have to clean out the filter with every cup. Instead of dumping out my coffee grounds into my compost container, I’ve discovered new and interesting ways to reuse your leftover coffee grounds. If you don’t grind your own coffee beans, you may be tempted to after reading these hacks! Step 1: dry coffee grounds in the oven, on a cookie sheet, and store them in a paper bag until the moment of truth. Step 2: hold hands out, mouth open in a silent scream, watching but not able to reach in time the child who is projectile vomiting on the new rug. Step 3: retrieve the bag of used but now dry coffee grounds. Sprinkle them liberally on the ‘puddle’. Let it sit. The grounds will a) soak up a lot of the liquid, making it easier to clean up and b) deodorize the carpet in the process. Now, on to some less gross uses for your coffee grounds! Used coffee grounds sprinkled regularly into your compost heap or container will help to balance the pH levels in your compost. This helps to degrade the food waste more quickly. As a bonus, the grounds help with the smell. As an EXTRA bonus, coffee grounds will attract the worms that will also help in the composting process. Your refrigerator – no need for baking soda. Just fill a cheese cloth with dry grounds and leave the bag in the refrigerator. Your outdoor garbage can/dumpster – fill some old tights with dry grounds and hang them inside the cans: instant air freshener. Cooking smells on your hands – when you cut up onions or garlic, there is little that can remove that powerful smell. Take some grounds, add a little water and rub it into your hands. Rinse with cool water and you’re back to smelling like you. Stinky shoes – put dry grounds in a cheesecloth and place them in the shoes at night. By morning, you and your shoes should be ready to start the day. Do the neighbourhood cats like your garden? Sprinkle used coffee grounds liberally around your plants and flowers and most felines will step away. Apparently, ants and slugs aren’t fond of the smell or the texture either so up the amount in areas of your garden that see a lot of traffic from these pests. 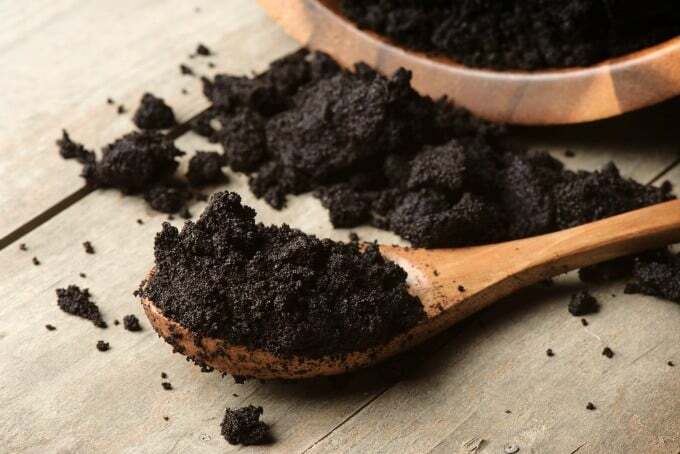 Adding coffee grounds to your garden has the added benefit of being good fertilizer for all plants but in particular ones that are high in acids, like tomato plants, roses and hydrangeas. And in the beauty aisle? Coffee soap – this is an easy soap recipe, making an excellent gift for the coffee lover in your life or better yet, keep it for yourself! Coffee body scrub – this is another easy recipe that makes a great gift as well. Hair scrub – use a handful before shampooing to remove product build ups! Just beware if you have light or treated hair, as this can darken your tresses just a mite. DIY Facial – this recipe for a coffee grounds facial actually sounds tasty but best to leave it on your skin and avoid dipping in with your fingers! With all of these suggestions, you never need feel guilty for making that extra pot of coffee in the afternoon. Now you can use all that newfound energy to reuse those grounds in different ways! If you want to make sure you always have a supply, check out these coffee subscription boxes to have fresh beans delivered right to your door! Do you have a use for coffee grounds that I didn’t mention? Let’s hear it! 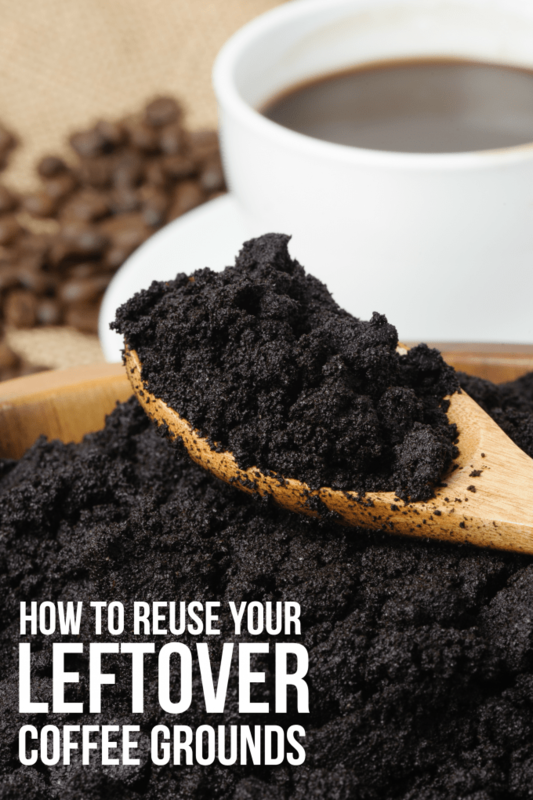 Some really good tips for how to reuse coffee grounds, many I would of never thought about. Thanks for sharing. Thanks for the tips! I’ll have to start using grounds in my garden! We’ve been using coffee grinds in the garden for years! Thanks for the tips. Also wondering what to do with them. I totally compost – and this year I’ve started a vegetable garden..(big aspirations!) so hopefully these will come in handy! A good tip about using the coffee grounds in flower bed. Really good tips. I especially like knowing they’re good for the pH of compost! I use them in compost all the time, but some of the other uses are new to me. Thanks! Lots of great ideas, I knew about using in the garden and on plants! I am so jealous right now I would love to have a coffee machine that grinds the beans right when you want your coffee!! There were a lot of these tips that I didn’t know, I didn’t know that you could use them to absorb unpleasant smells for example or deodorize the carpet. I’ve heard that coffee grounds and dried eggshells (ground) are great for tomatoes and peppers. They add calcium to promote strong growth. I’m going to try it out. Coffee grounds placed in the row along with radish seeds keep the maggots out of the growing radishes. It may also help with the carrot rust fly, turnips. Hi! Found you via Pinterest and just had to contribute. 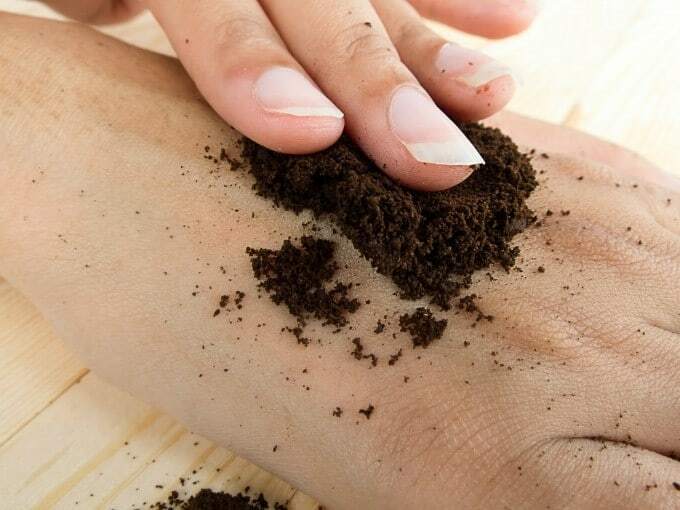 Coffee grounds help dissolve stumps in the yard. I just dug a hole in the stump and packed ’em in and set something on top so they don’t wash away. The stump was gone into the ground in about 3 months. I’m not in an area I can set it on fire, nor handle a stump grinder, so this worked for me. Sugar works, too, but that is much more $$. I also let them dry and used them as a carrier for grass seed, milky spore, and other things I’d spread on the lawn. Coffee makes great lawn fertilizer, too. Some ideas! My gardens are very fertilized with espresso. LOL! LOL! I never thought of using coffee grounds to deodorize! Mixed with dirt they create an excellent medium for raising (fishing) earthworms. Just outline an area with old bricks or slim logs and fill it up with the grounds and dirt mix. Et voila!